A 20-year-old hockey player from Sherwood Park will be starting his next season with the NHL. 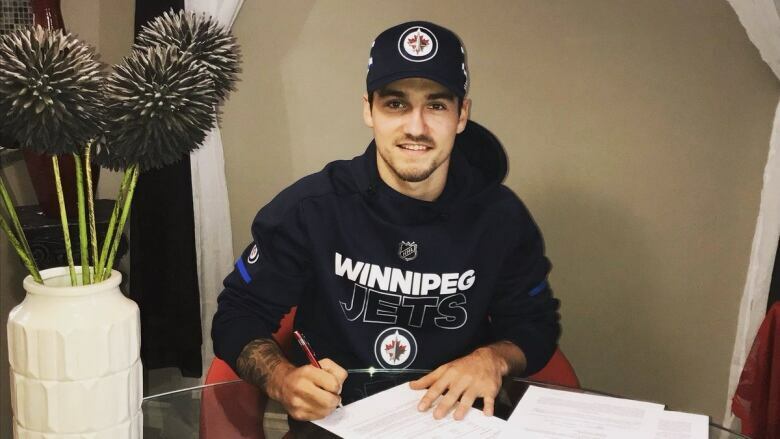 Left winger Skyler McKenzie signed a three-year entry-level contract worth $2.2-million with the Winnipeg Jets earlier this month. "It was always a dream of mine," McKenzie told CBC Radio's Edmonton AM Tuesday. "I've been working very, very hard since I can even remember to get to this point in my career and I couldn't be more excited." McKenzie, originally from Medicine Hat, put on his first pair of skates when he was two years old. After seeing their toddler wandering around, with a mini-stick constantly in his hand, his parents enrolled him in minor hockey at the age of three. He moved to Sherwood Park around the time he began junior high school, joining the tight-knit and competitive hockey community, which has produced other NHL-calibre players, including McKenzie's close friend, Brendan Guhle. Guhle, a year older than McKenzie, signed with the Buffalo Sabres in 2017 and more than 20 professional games this past season. "I've looked up to him since I can even remember," McKenzie said. "Every one of these Sherwood Park guys just push each other to get to the next level." McKenzie, who played with the WHL's Portland Winterhawks for the past five seasons, was drafted by the Jets in the seventh round in 2017. He led the Winterhawks' scoring last season with 47 goals. When his team was eliminated from the playoffs, he was seconded to the Manitoba Moose for the AHL playoffs, where he recorded his first professional goal, a game-winner. "My time in Portland was really really good and I couldn't be more happy with how my career was there in junior hockey," McKenzie said. "But I'm very happy to get back on this side of the border and continue my hockey career over here. McKenzie heads to training camp in September. "I can't even put it into words. It's just a whirlwind of emotions and I can't be too excited because the work is just beginning," he said. "We'll just take it one step at a time and see how it goes from there."